After riding in the car-forever-I finally was let out to stretch my legs and then I was put on my person’s lap and ended up in this big room thing with two stories. I nudged my person to take us to the top, and when the engines started I was able to hang out with the wind in my hair. There was water all around and it was great fun. There was a big yellow lab on the deck below us, but he was sort of green looking and cried the whole time we were flying over the water. Then as fast as we started, the fun was over and we went slow bumping along side this wood thing. People left the big fast room and I was handed over to a nice young guy with a bicycle while my person climbed up on the wood thing beside me. The air here was full of awesome smells. Lots of people, though, I’m not a fan of crowds. They tend to step on smaller dogs. That was why my person picked me up and carried me. The people were nice at this level. I pretended to be scared--gave a good show of shaking and big sad eyes. It got me all kinds of pets and coos from people. They treated me like the royalty I know I am. But I was not here just for the groupies, or the array of strange smells like fish, and sea birds, and candy, and ice cream, and chocolate-which I’ve never tasted but that doesn’t mean I won’t stop asking. No, I also wasn’t here to see those giant clomping dogs pulling the strange wooden carts full of people. Tragic if you ask me, but some dogs like that sort of thing. I wasn't even here for the wind in my hair. I had come all this way for journalistic reasons. I was here to interview the famous Mal McMurphy of the Historic McMurphy Inn and Fudgeshop. She waited for me on her red pillow dog bed beside the reception desk across the lobby from the fudgeshop. 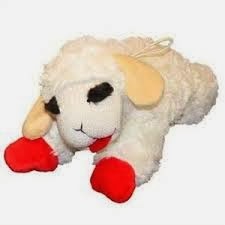 She had a LambChop toy in her bed next to her and I knew I was going to like this pampered pooch-we had a lot in common. A quick polite sniff, and we connected immediately so I got to work. Little dog: What’s it like living in the Historic McMurphy Inn and Fudgeshop? Mal: Not bad. I like the older woman, Frances, a lot. She sneaks me treats. My person, Allie, lives on the top floor so I get to patrol the place from top to bottom. Little dog: Do you ever get to taste the fudge? Mal: No, but I get special dog treats from the Barkery down the street. 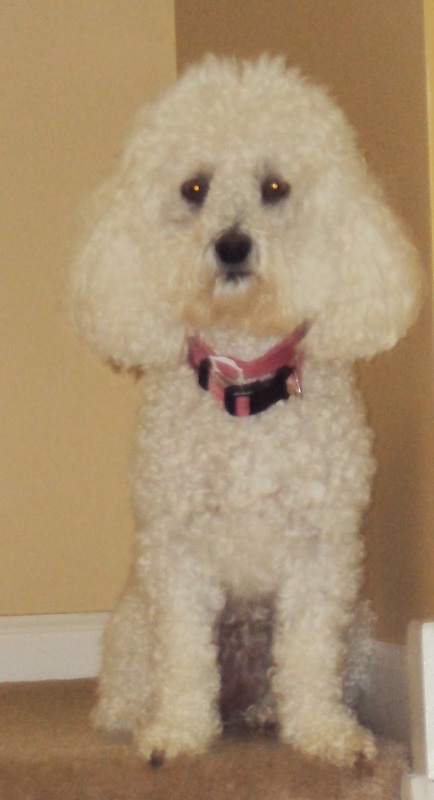 Little dog: Bichonpoos, like us, are pretty social dogs, do you ever get lonely? Mal: Naw, people come and go all the time. They always take a treat from the bowl on the desk up there and I do my tricks for them and get the treat. If they forget about the treats I poke them with my nose. Little dog: Good call. I understand you help solve murders. What’s that like? Mal: My person, Allie, isn’t from around here, even though she tries to tell everyone she is. It means she gets into all kinds of mischief. It’s why Frances got me, to help keep Allie company and keep her safe from bad guys. Little dog: Sounds like you enjoy your work. Mal: Some days are killer, but for the most part, yeah. It’s good. Little dog: Is that the door bells? Mal: Yes, someone’s coming in- look cute and follow my lead. We’ll both get treats out of this. 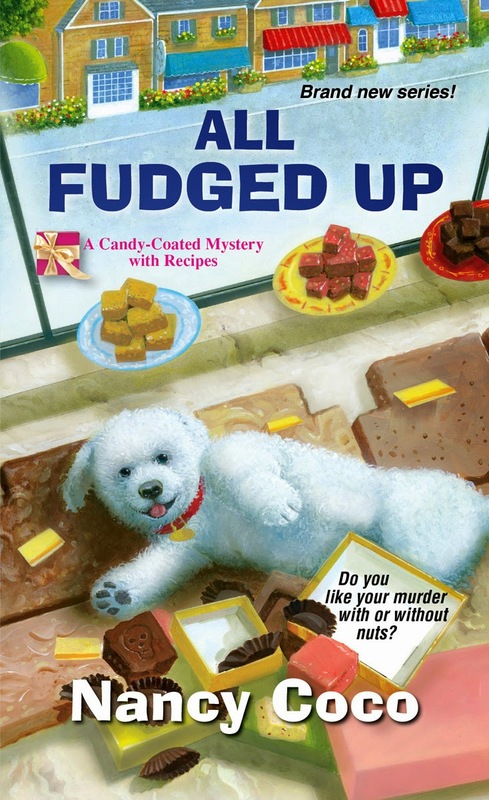 All Fudged Up, a Candy Coated Mystery, is available at a bookstore near you and online at amazon and BN. Sounds like a fun read. Looking forward to finding it at the book stores. Treats! We must talk to Willow about allowing her customers to give us more treats! Maybe she should switch to selling dog treats and toys. Don't tell her, but sewing and embroidery machines aren't very interesting to dogs. Enjoyed the first book. I haven't tried the interesting fudge recipes yet. I like my murders with nuts, please. They add so much fun to cozies. Hi Dianne, Little dog says she likes how Mal solves the mystery. As her person, I think Allie McMurphy, actually put the clues together first. But we won't quibble. I hope you enjoy the read! The fudge recipes have all been taste tested by my person's research and development team. They say that the key lime and the dark chocolate cherry rum were their favorites. Read the book and loved it. Like your interview Little Dog. I agree Mal was onto the murderer right away! Those little growls and snaps were a great clue! Always trust your dog's instinct. I was ready to try the Key Lime fudge, but I didn't want to make it. Woof!